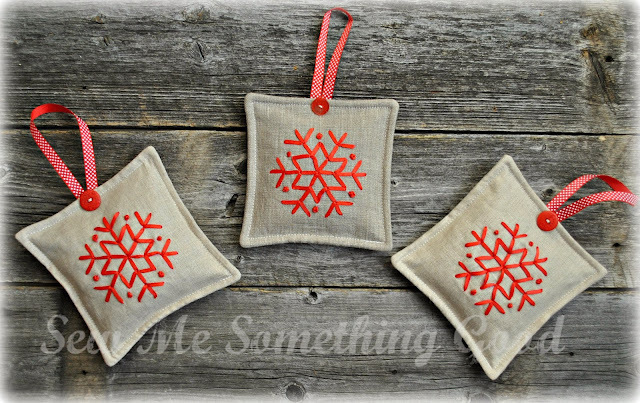 These Spicy Snowflake Sachets should deliver some seasonal cheer to the recipients! I've been wanting to try ribbon embroidery for ages, so when I found myself needing 3 thank-you gifts this week, I decided to go for it! 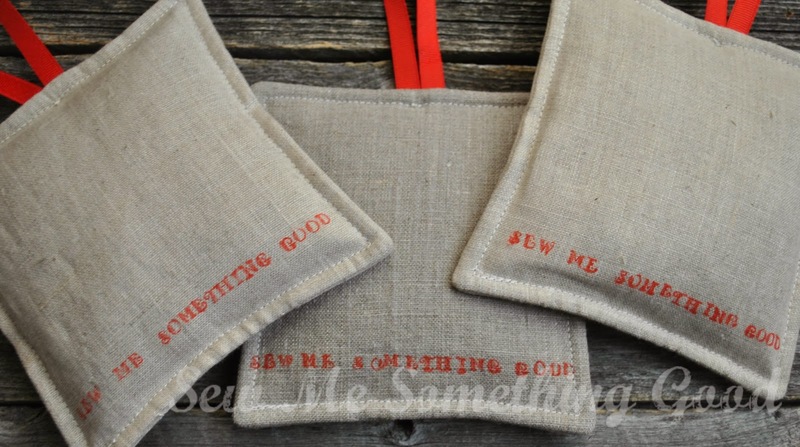 It seemed the perfect opportunity to grab red ribbon, linen and a special button to make sachets. Stitching with ribbon is a little trickier than working with embroidery threads. First difference is securing the ribbon for stitching (you don't tie the end into a knot and you also need to secure the end that passes through the eye of the needle before you can start embroidering your design). 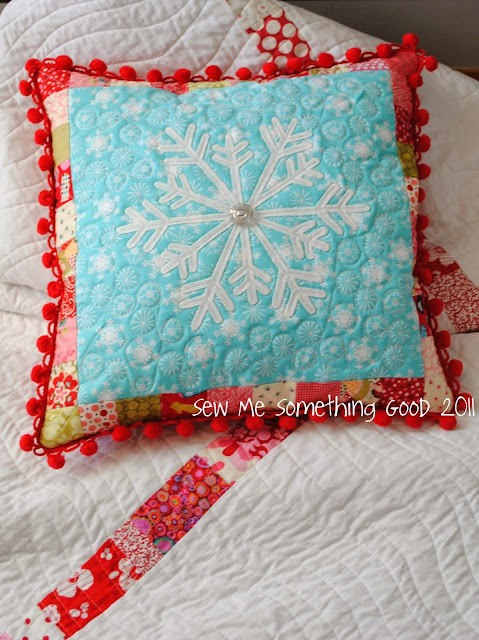 Once the ribbon has been secured, at both ends, you can start stitching. Then you must watch for the ribbon twisting as you form stitches - not difficult to remedy (place your thumb under the ribbon as you gently pull the ribbon to form the stitch - the slack in the ribbon means you can untwist it as you stitch). 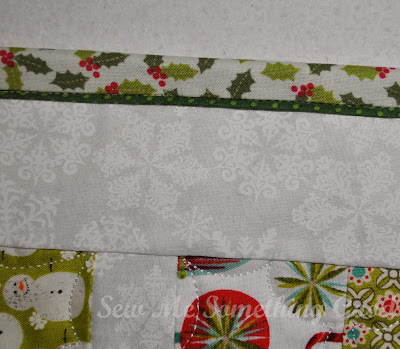 When the stitching is complete, you must take a couple of stitches into ribbon already stitched, on the wrong side of your work, to secure the ribbon (again - no knots!). Oh, and the other tricky bit was doing French knots. 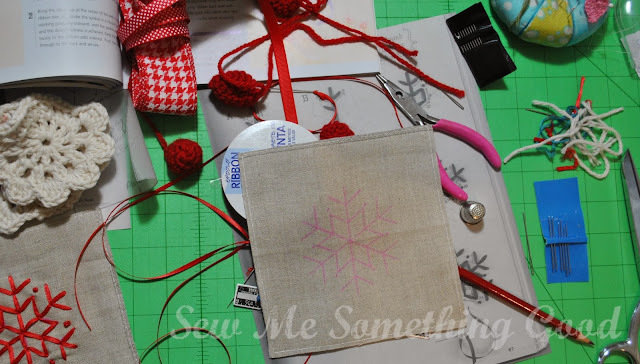 There seemed to be a balance in how tightly you wrap the ribbon around the needle to form the knot - too tight and you won't have an easy time pushing the needle through - too loose and you won't form a French knot! I sorted it out though, and I have to say I love the way those ribbon French knots look. For the back of the sachets I wanted to add a tag of some fashion. 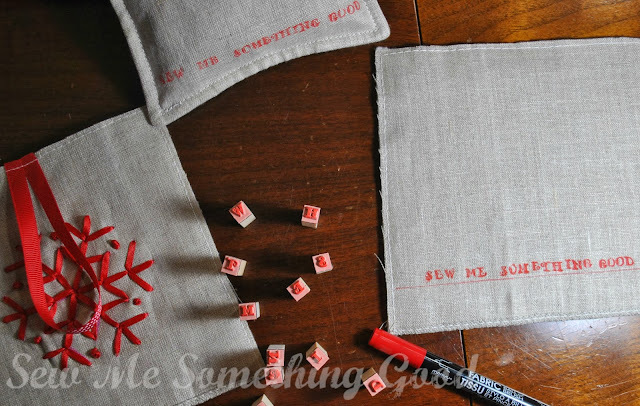 I came up with simply using rubber stamps and a fabric marker to spell things out. The finishing touch is dotted ribbon and a red button for each sachet. The very best part though, is the mix I used to fill each sachet. I combined whole spices, such as cinnamon sticks, nutmeg, cloves and allspice, to create a very spicy scent for the sachets. My sons say the sachets remind them of their favourite cookies, "Peppernuts"( the recipe I use has been with me since I was a 10 year old and copied from a neighbour who introduced me to this spicy, delicious cookie.) Peppernuts are German in origin and known as Pfeffernusse cookies. 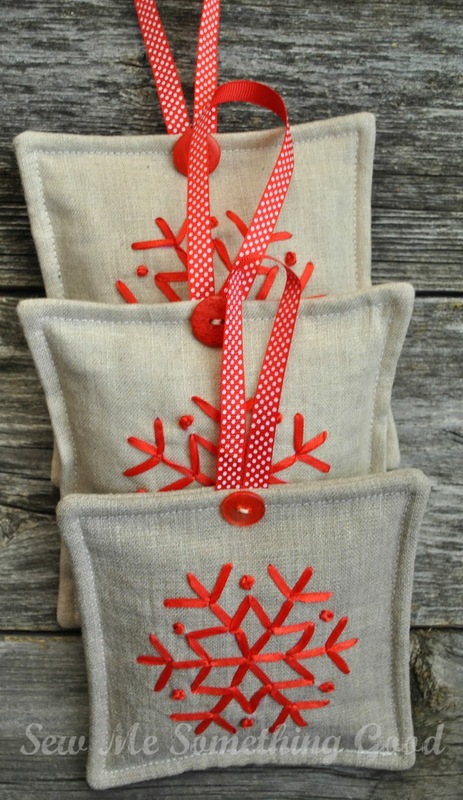 I'm so happy with how these sachets look, that they stitch up quick and look (and smell) quite festive. They could even double as ornaments, I'm thinking. I hope the recipients like them! Wishing a Happy Thanksgiving to all my American friends! 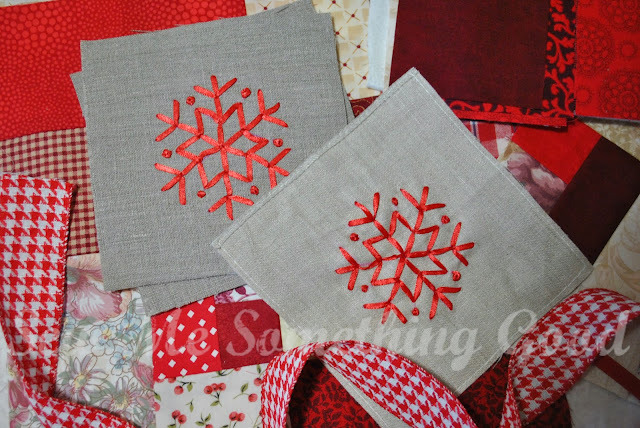 I'm loving the simplicity of red ribbon with linen! 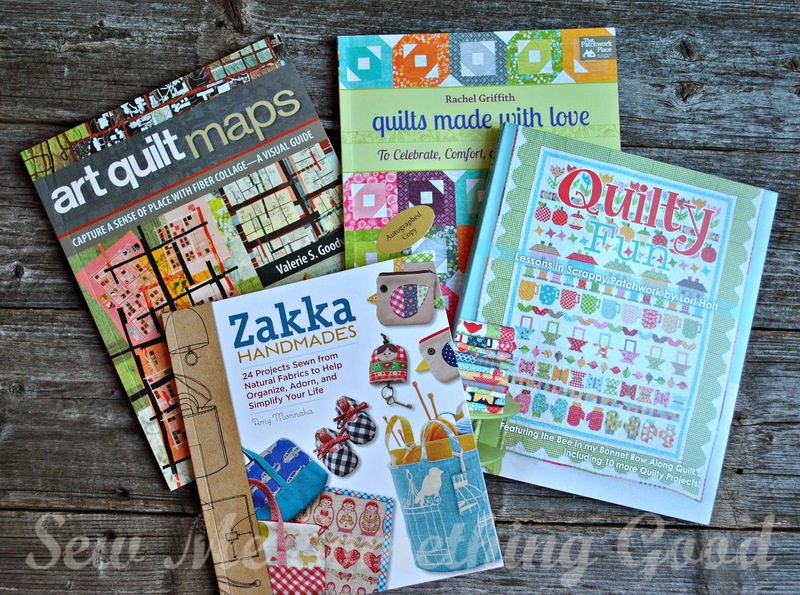 Have you heard about Jacqueline's Bloggersquilt 2013? 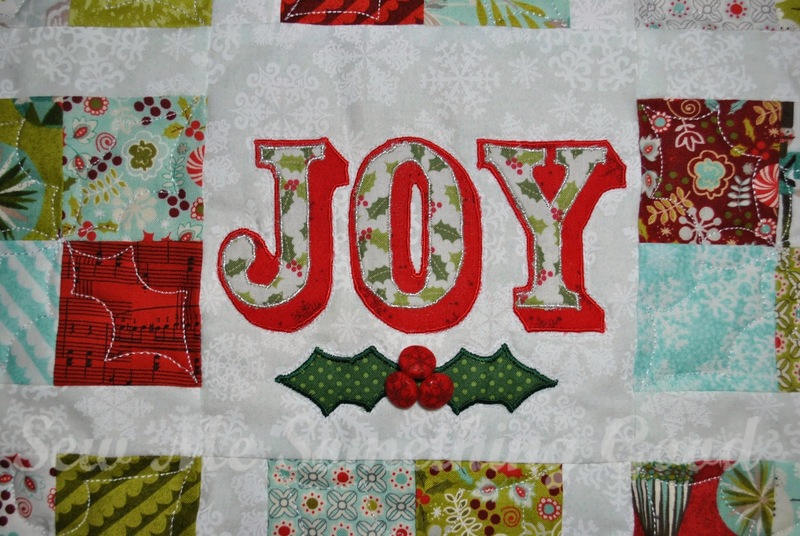 Well, I wasn't aware of it until my friend, Baukje wrote me an email telling me about a lovely quilter named, Jacqueline, and her project. (click here to scroll through the posts with pictures of the blocks she's made). 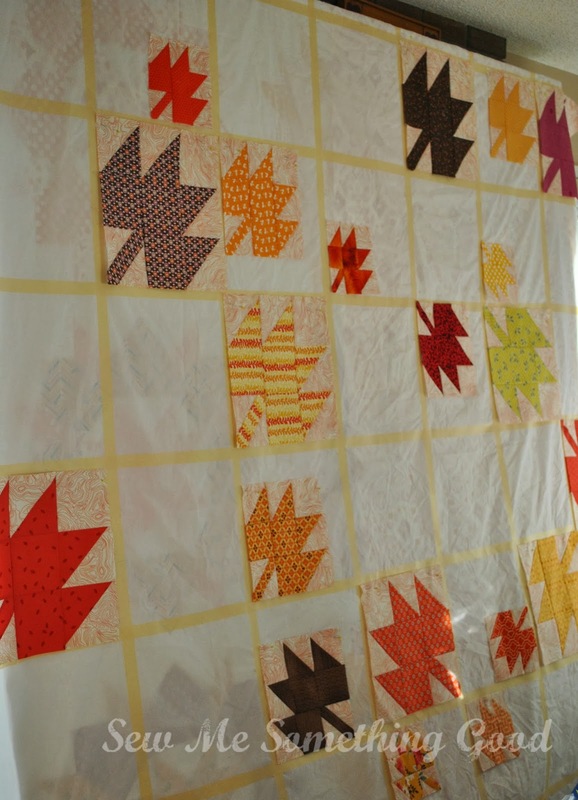 Baukje suggested I contact Jacqueline and contribute the block I considered my favourite, along with why I chose it. Want to see what I chose? 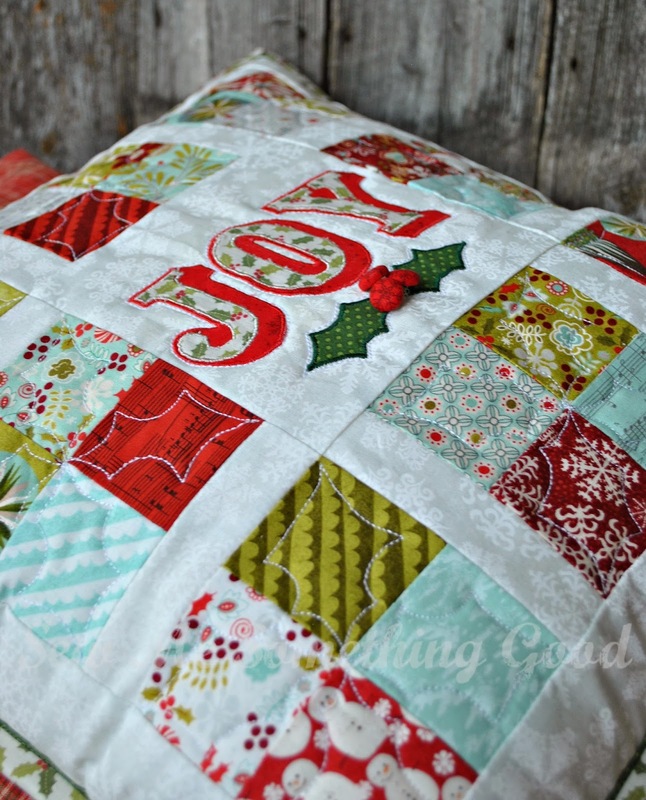 Pop over to see Jacqueline today, as my block is this week's feature. Then, please consider suggesting your own favourite block for Jacqueline to make (just leave a comment on her blog letting her know you're interested in contributing). 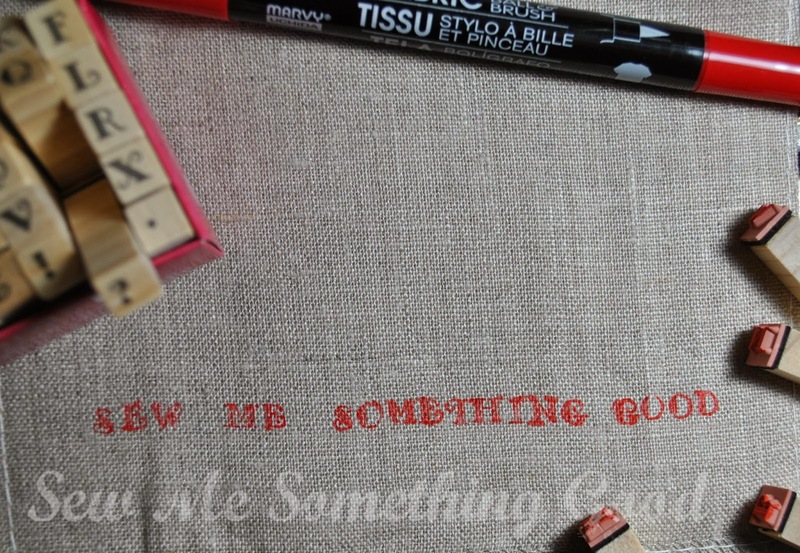 and a peek at the fun I'm having using stamps and fabric markers. 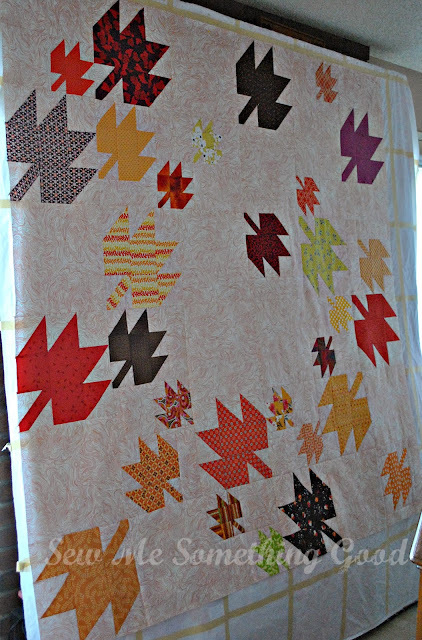 I'm happy to report that I've finally made those blocks into a flimsy! I'm now waiting for some reno work to be completed so that the floorspace I use for basting will be free to use again. Until then, I get to enjoy seeing this top pinned to my design wall. I'm loving it! Wow. It's hard to believe our week of blog hopping across Canada is over. This was my first year participating (is it too early to be looking forward to the next one in 2014?) and I had so much fun visiting blogs and reading comments! Thank you for each and every one. and I hope you will enjoy using it. My hope was that each of you would feel as if you won something when you came to visit. Hi Katherine, thank you so much for linking to our blog today :)It was a total treat to come across your blog and I am definitely a follower now! 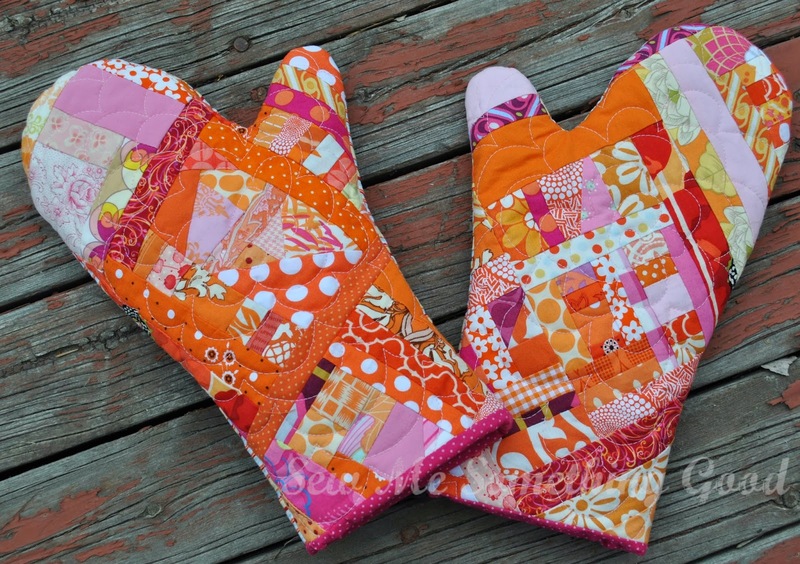 I absolutely adore that Pop Star quilt and those oven mitts and note cards - eeek! Cuteness overload for sure. Many thanks to Sew Sisters for sponsoring such great giveaways during Blogathon Canada! 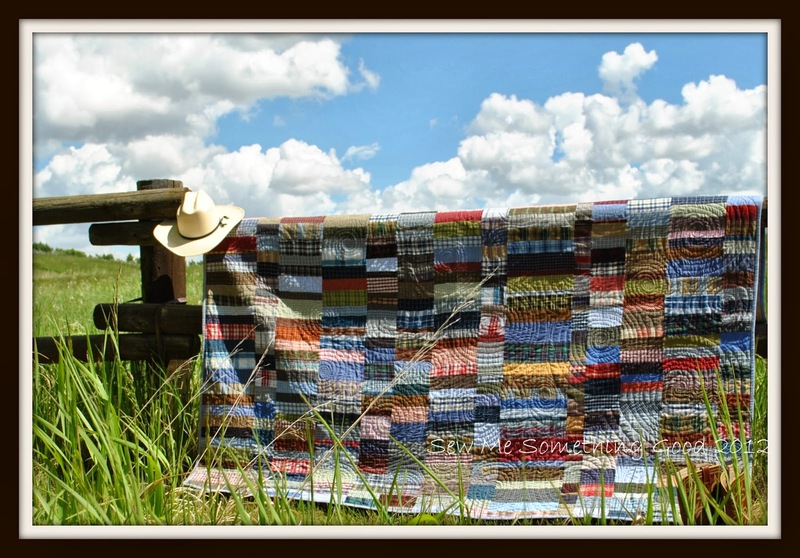 I'm Katherine, and I'm delighted to be co-host for today's featured province of Alberta, along with Andrea from Urban Quilt Works. 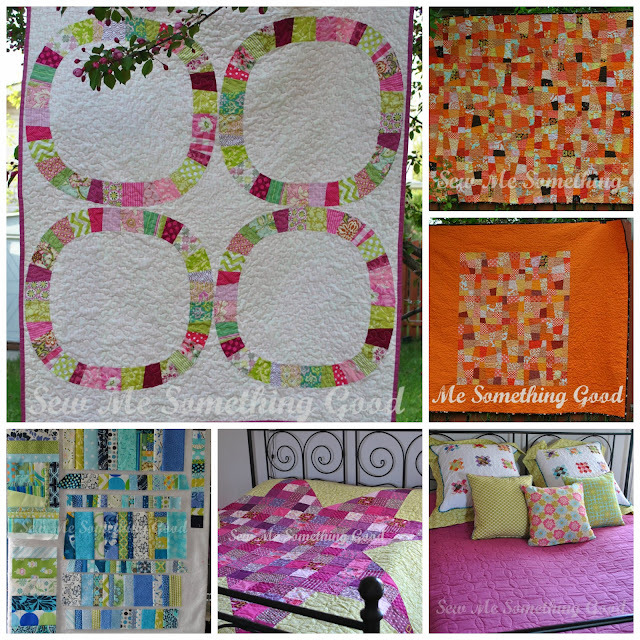 I've been sewing since I was a girl, however I didn't wander into quilting until after I became a Mom. Until that time I sewed mostly clothing, along with toys and as many home décor items as possible (I'm a trained drapery seamstress). I grew up with quilts though, and two of my most treasured possessions are handmade quilts I received from my maternal grandmother. As much as I admired quilts, I wasn't sure if I would enjoy making them. Turns out, I do. After my first quilt, (a twin sized quilt I made for our youngest son from his babyhood flannel receiving blankets), I was hooked. 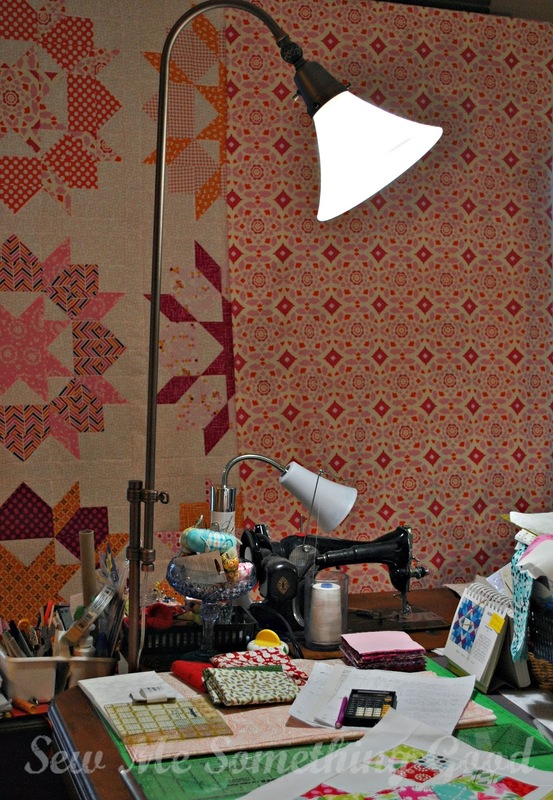 These days, when I'm not helping my husband with his custom kitchen business, you will find me in my sewing room... dreaming, designing and likely working on a quilt (or two... or three...) amongst my other sewing/crafting projects. Want to see a few of my favourites? "Anything but Plaid" is a quilt I test patterned for Amanda Jean Nyberg (it's her Candy Coated pattern from Sunday Morning Quilts) and it uses some plaids from shirts my oldest son wore as a boy. He's a tall drink of water these days, but he hasn't outgrown his love for plaid. 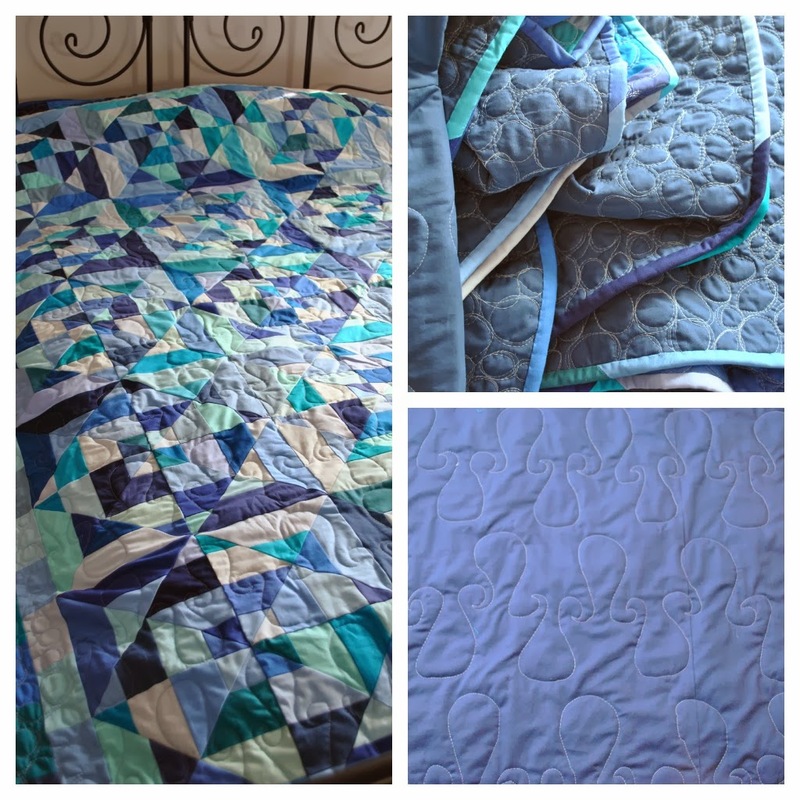 "Blue Beginnings" is my first solids only quilt and it was made to mark my youngest son turning 18. 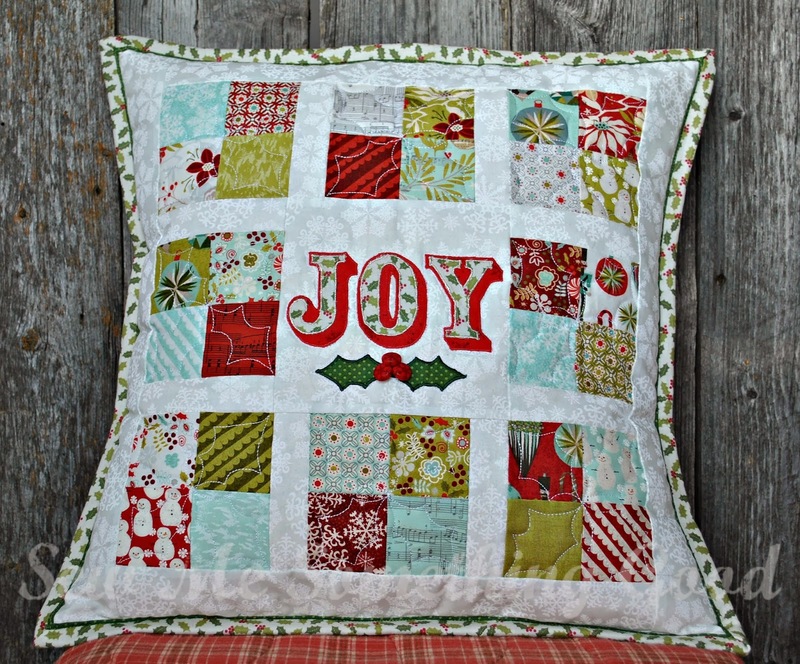 It was so fun to make and I loved trying a new design in free motion quilting. The above mosaic is a good example of my love for colour. "Pop Star" is a favourite for it's colour and for the quilting. Last in the mosaic is a scrappy blue/green quilt that is still in the works. 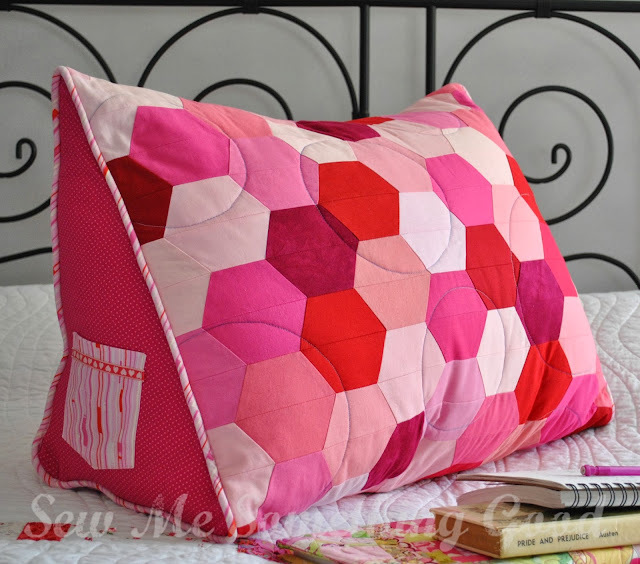 The pillow above is my own design - the "Triple Hex Reading Pillow" and I made it into a pattern. 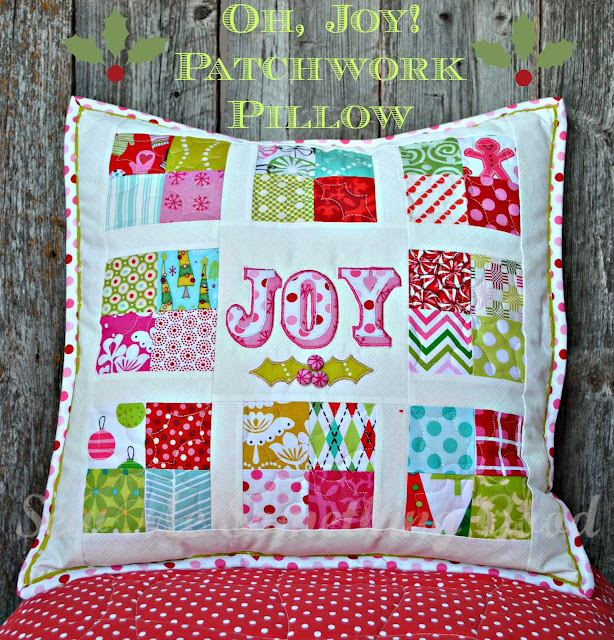 Not only do I love making quilts, but I LOVE making quilted pillows! "Sparkle Snowflake" remains one of my all-time favourites and it graces our living room every winter. 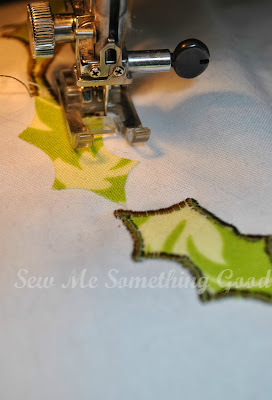 All this sewing leaves me with lots of scraps, which I love. I love the freedom of scrap piecing and the joy it brings to make leftovers into something useful. 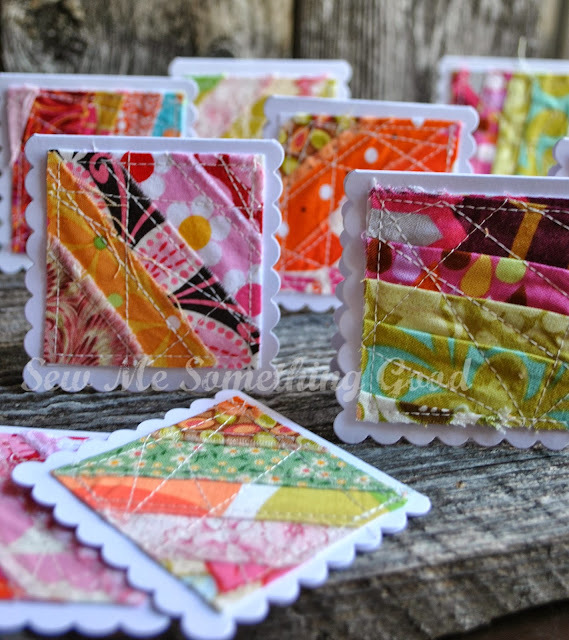 Each notecard finishes at 3" - so these are great for using up tiny scraps. or these mini notecards. It all makes me very happy! It's time to get to the really fun part! 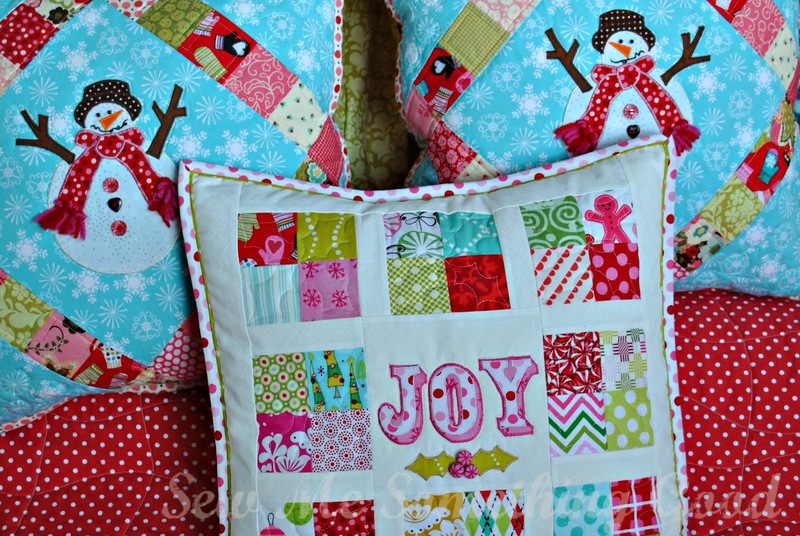 As I browsed through Sew Sisters lovely shop, to select your giveaway prize, I found my creative juices were stirred. I could not help thinking that I would like to design a project for you to make from the fabrics I chose. I asked Carol if that would be alright and not only did she say, "Yes!" - she sent me the materials to make up my design idea. Yipee! and here is what I designed to use them. and a super easy French back. 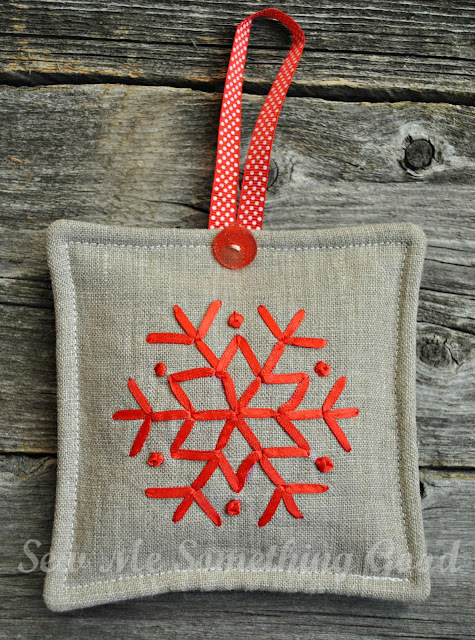 Can't you just picture making one of these for a gift? The pattern is written as a PDF file, so even if you don't win today's bundle of fabrics, you can still make your own version. 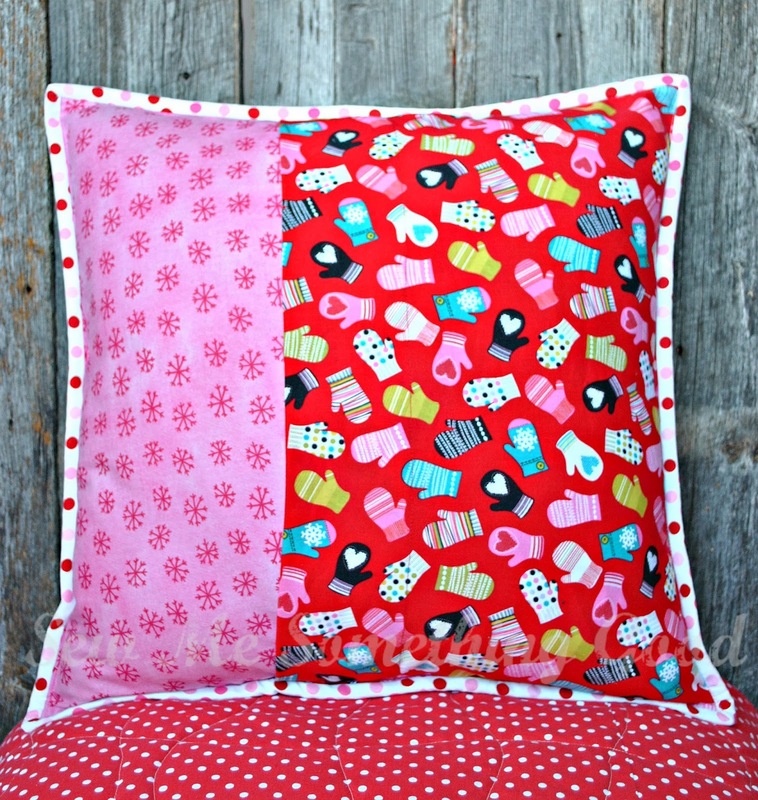 - which is open internationally (thanks, Sew Sisters!). Entries close at midnight EST Nov. 23rd. I will draw the winner the day after the end of Blogathon Canada using the Random number generator. (leave your email in your comment if you are a no-reply blogger). Sadly, if I can't contact the winner, I will have to re-draw for a new winner. Oh, Joy! Patchwork Pillow pattern. before popping by all the other Alberta quilting blogger's on my list. 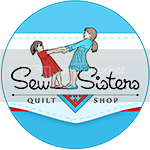 Huge thanks to Sew Sisters! 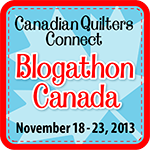 I feel honoured to have been a part of Blogathon Canada and I'm really looking forward to finding new blogs to visit throughout this week and making friends! (Friendships are what blogging is all about). Thanks so much for stopping by today. I hope you found some inspiration and look forward to seeing you here again. Oh, and don't forget! 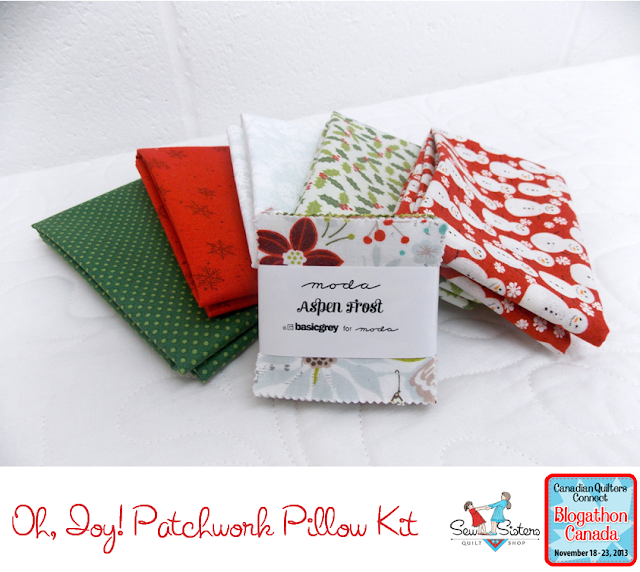 Be sure to visit the Sew Sisters Blog today, for your chance to win a lovely giveaway prize sponsored by Robert Kaufman!!! Happy Tuesday! I'm still here and I'm still in the throes of a cold. I'm getting very tired of coughing and going through facial tissue at a steady rate. 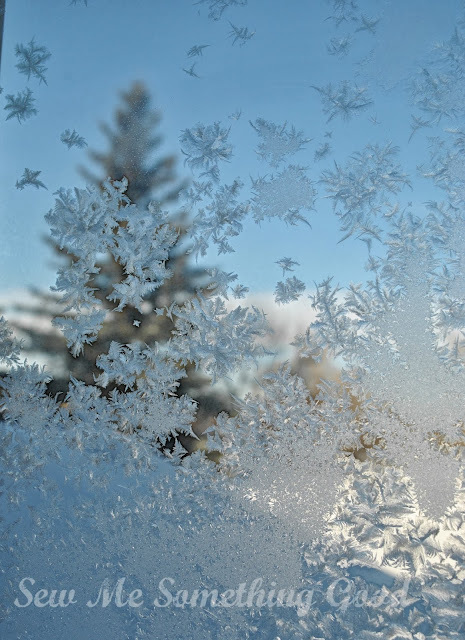 The upside of being sick is that I get to stay indoors (avoiding our recent cold spell... it's -15 Celsius on the thermometer but feels like -27 thanks to the wind chill... Brrrrr....). Hello, November in Calgary! We had fresh snow overnight and it's blowing around out there at the moment, so it feels a little strange to be working on a project that represents a season so unlike the current view out my window. 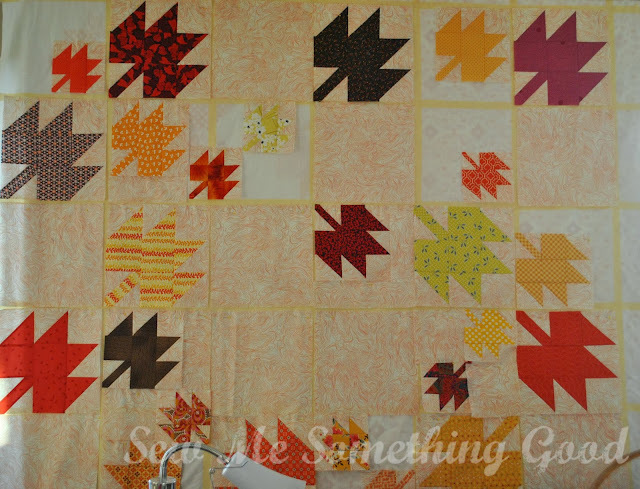 Despite being under the weather, I have made a few more blocks and am now tweaking my layout on the Modern Maples quilt. I'm having lots of fun working on this (oh, the colours!) and think I'm ready to start piecing the top together. Yay! I'm also getting ready for my day as co-host (tomorrow), on the Blogathon Canada hop which is happening this week. The first two days have been great! It's so exciting to meet so many talented quilters across Canada. 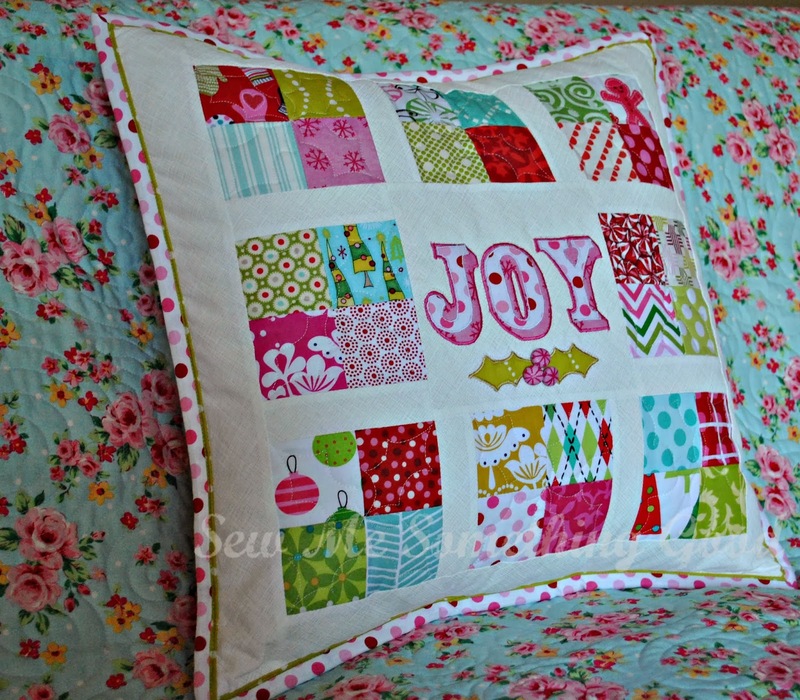 I hope you're following along - there's lovely giveaway prizes at each host blog, PLUS daily giveaways at Sew Sisters. Currently it's -8Celsius here in Calgary, so I'm inside nursing my cold, but enjoying the view from one of my windows. 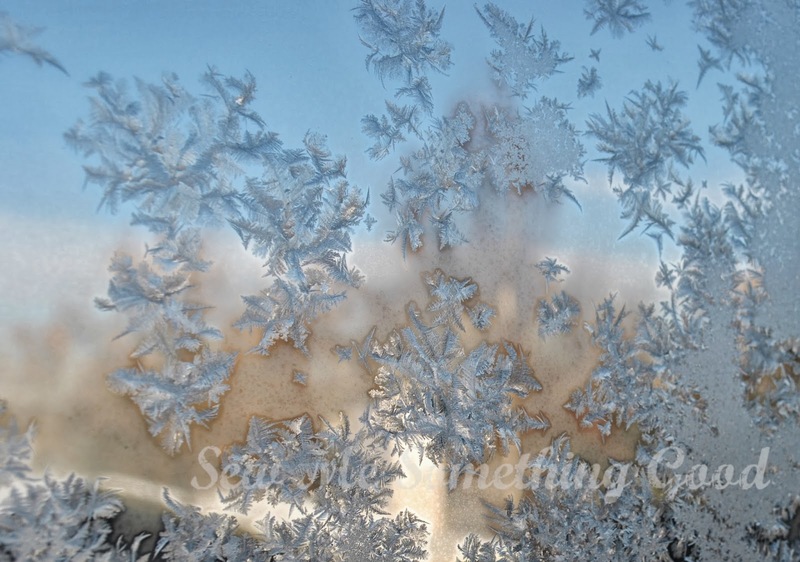 Sunshine + ice crystals = beautiful! Also, I wanted to remind you all that tomorrow you can tour my beautiful country, from coast to coast, from the comfort of your own home (don't worry, not all stops will have such winter scenery ;o). It will be a fun week! I hope to see you, as I stop in at the blogs being shared each day. Thanks to Sew Sisters for organizing such a wonderful event! 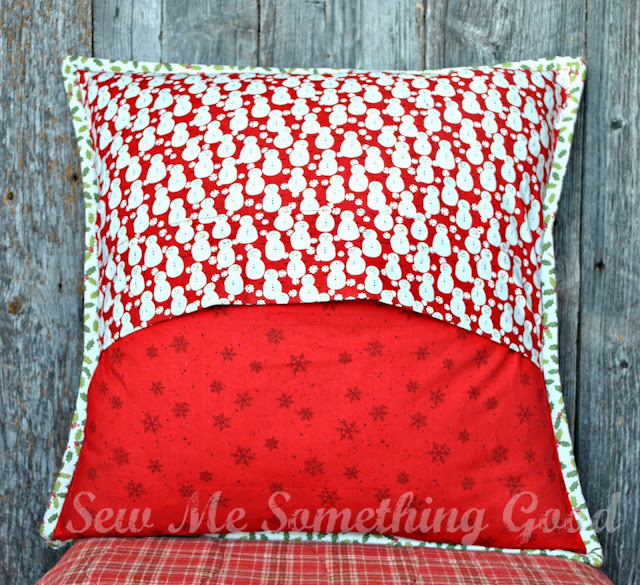 Would you like a peek at one of my late night sewing projects? 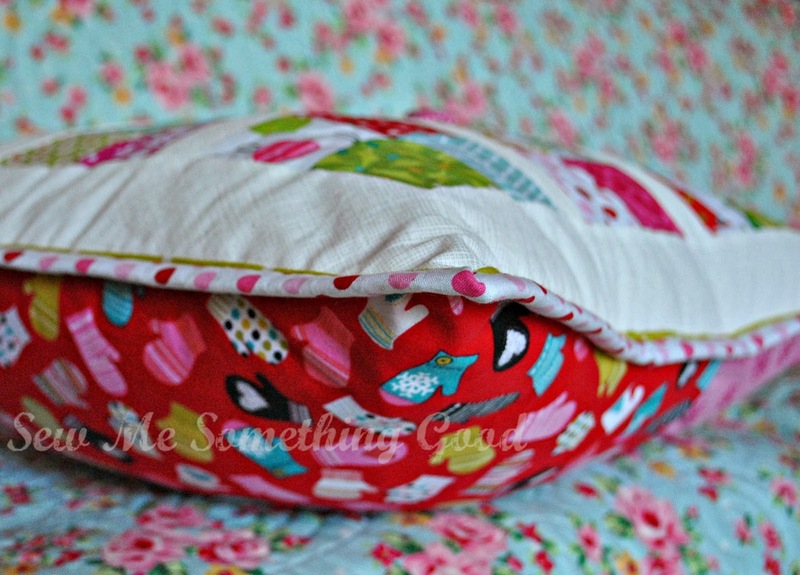 Despite appearances here, (or rather, my lack of appearing here...) I have been sewing, albeit quietly. 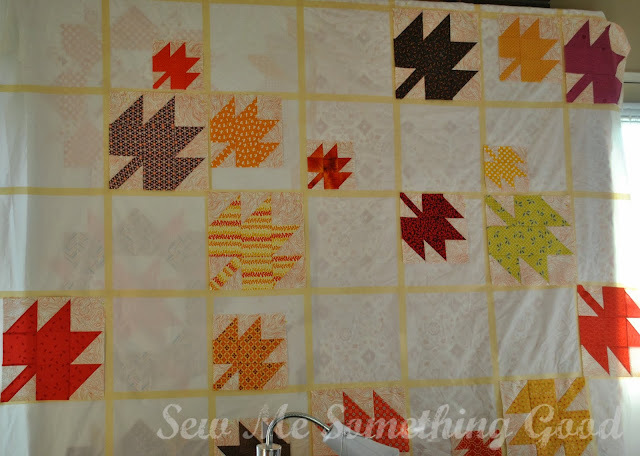 but, if you look past my sewing machine (and mess) and you will see that my swoon blocks are finally a flimsy and half of the backing has been pressed for it. About time, right? I used a queen sized flat sheet with some masking tape to mark out a grid for block placement. So far, so good. This is working really well for helping me combine the 3 different sized blocks. Now I can see that I need to sew a few more of the smallest size to help me convey the sense of swirling leaves, which was my design goal with this quilt. 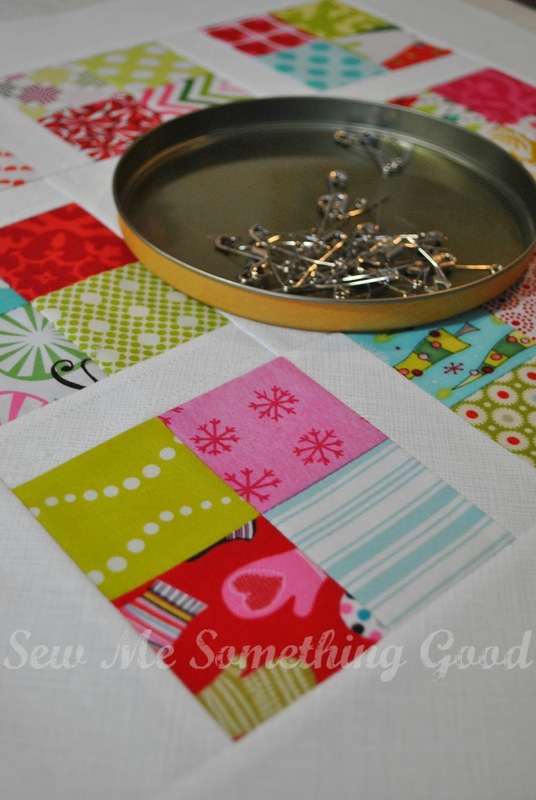 I can hardly wait to start quilting this! Not all those blank squares in the layout will be background fabric only... I see I need a few more of the smallest sized blocks to add to my design (the full design isn't visible - my sewing table blocks your view). Along with these two large projects, I've been quietly working on some smaller things that I can't wait to share. However, I may have pulled one too many late night sewing sessions. I came down with the most horrible swollen and sore throat late yesterday, meaning I didn't get much sleep last night and that I feel rather yucky today. Totally caught me by surprise, as I can't even remember the last time I had a sore throat. My family is steering clear but also confused to see me sick as I'm usually the one that skips getting sick. I guess it was my turn. ;o) Anyways, it looks like I better slow it down today and see if I can't kick this. Time for more tea and a nap! Every year I buy a poppy to wear for Remembrance Day. 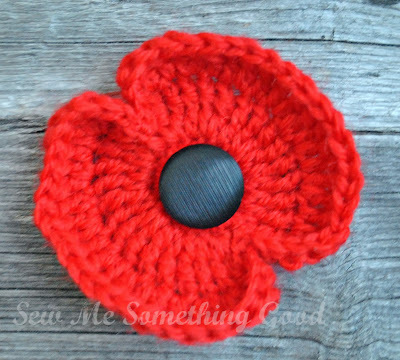 Every year, I lose that poppy - usually within the first day of pinning it to my coat. How disappointing! It's not that losing something I had donated money for that bothered me, it's the fact that it seemed so disrespectful to be "poppy-less". Buying multiples didn't help my problem either. The solution? Make one that will stay pinned to my jacket more securely! All it takes is a scrap of yarn, a black button and a sew-in pin backing to make your own. Here's the free pattern I used to crochet mine. It's quick and simple to make. My money has been donated and my little poppy stayed pinned. A lovely little handmade reminder to honor those who gave their lives for the freedom I enjoy. Maybe, it will help if I promise to share more about them as I spend time going deeper into them? I know I will be bookmarking all sorts of projects I want to sew. Yay! Huge thanks to Kimberly Jolly and her team from the Fat Quarter Shop for spoiling me rotten and making me all kinds of happy. Something else that is making me all kinds of happy is my progress on a new project. 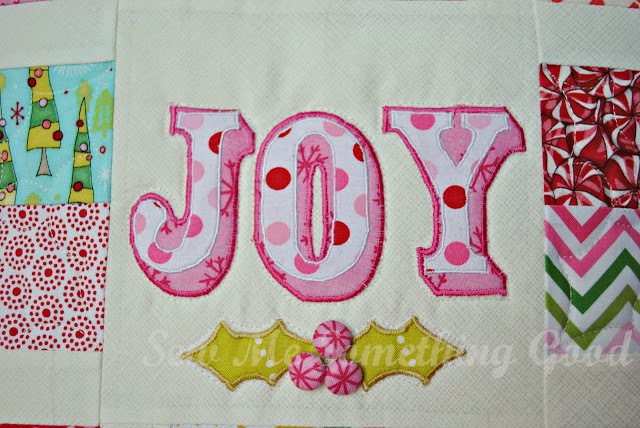 Yesterday, I was hand embroidering and today I tackled some machine applique for it. Each of these allowed me the opportunity to use some of those new threads I bought this fall at the WonderFil Threads booth. I'm giving two thumbs up on both types of the thread I tried. They worked beautifully! Seeing the combination of machine applique with my hand stitching is making me smile. I love it when an idea works out!